Historical content: I wrote this article over 10 years ago on 2006-12-14. You are viewing an archived post from my old WordPress blog. The archive contains over 1,600 articles written over a ten year period. The formatting and contents of the posts may not display perfectly. The XUL UI for the excellent AsUnit by Luke Bayes and Ali Mills has been missing an installer/application bundle for OS X for a while now so, this morning, I decided to create one. After all, now that I have a Mac, how could I pass up the chance to contribute both to the Mac community and to one of my favorite open source Flash projects at the same time? It's a standard Mac application bundle. To install it, just mount the DMG and drag the application icon to the Applications folder icon. In other words, just install it like any other Mac app. Enter a name for the project. It doesn't matter what you enter here, it's a description solely for your benefit. Under templates, choose the version of ActionScript that you want. For ActionScript 2, there are two options. I selected the one for Flash 8, which uses the AsUnit 2.5 framework. Based on which version you select, make sure you include the correct framework in the classpath of your Flash movie later on. Select the source folder where you want AsUnit-X to create your class files. Select the folder that you want AsUnit-X to use to create your test cases. For simplicity, you can choose the same folder. Enter the name of a class in the Class Name text box (you can enter a fully-qualified class name that contains package information and AsUnit-X will create the package structure for you). Select the access modifier for the class constructor (or make it a Singleton) using the Constructor radio buttons. (Optional) Select a superclass at this point by either typing in the name of a class or select a class from the classpath by clicking the Choose button. (Optional) Add any interfaces that you want your class to implement by adding them to the Interfaces list box by using the Add button. If you want AsUnit-X to automatically create a test case for your class, check the Create Test Case checkbox. You can choose to make the test case a standard one (synchronous), a Mock Object or an asynchronous test (e.g., for testing classes that rely on externally loaded data). If you want AsUnit-X to automatically create test suites for your class, check the Generate Test Suites checkbox. Finally, click the Create button to create your class and your test case. Click the Run Now link next to Generate Test Suites to generate your test suite. Open up Flash and create a new FLA. Call it MyTestRunner or something equally exciting. I'm not a big fan of using a static main() method in Flash but, in this case, it makes sense so that your test suites can be run by both the Flash IDE (Macromedia compiler) and MTASC. Test your MyTestRunner FLA and you should see the default AsUnit interface appear with the familiar red bar that tells you that your test case (with an automatically generated failing test) was added to your test suite correctly. I realize that these are quick notes but I thought I'd jot them down here as I had a lot of difficulty trying to find documentation or tutorials for AsUnit, especially the 2.5 branch. I will try and create a more illustrated tutorial if I get time, with screenshots and whatnot. Install the Mac version of the XULRunner framework. 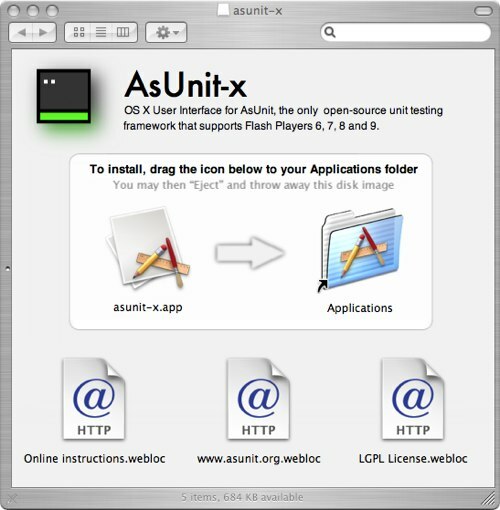 Downloaded the OS X build of the AsUnit XUL UI from asunit.org. Create an application bundle (a folder called AsUnit-X.app) in Finder and populate it according to the excellent instructions on the Deploying XULRunner 1.8 page at Mozilla and Ricardo Pacheco's XULRunner on OS X blog post. The exact rsync command to run is rsync -rl /Library/Frameworks/XUL.framework/ /path/to/your/bundle/AsUnit-X.app/Contents/Frameworks/XUL.framework/ (the Mozilla docs are a bit confusing on which folder you need to copy.) Make sure you create the Info.plist file based on the one in Ricardo's blog post. If all goes well, you should a running Mac app at this point. Add the framework. I added this into a folder called asunit in the Frameworks folder in the bundle. While creating the DMG, I came across an issue that caused me some delay (which was completely unnecessary!) After converting the disk image to a compressed image using the Disk Utility, Finder would no longer open the mounted image in icon view (on my system, it defaulted to column view). I saw that others were having this problem also and initially attempted to address it by using the pkg-dmg perl script from Mozilla. Unfortunately, that didn't like the symlink to Applications and tried to copy the actual Applications folder over and failed. So, I decided to follow the instructions on this thread but that didn't work either (although I am digging the power of the hdiutil command.) Finally, I decided to see if throwing money at the problem would work and tried out Drop DMG and FireStorm, neither of which worked. It was only at this point that I realized that there wasn't anything wrong with the image files I was creating but that I had had "Open new windows in column view" checked in my Finder preferences. Doh! Unchecking this showed that the image files were displaying correctly after all! I hope this makes AsUnit easier to access for developers on the Mac platform and that you enjoy using AsUnit-X. Are there any know issues with ASUnit and Vista? Can't seem to get in working. Any help...please? i'm having some trouble with asunix-x. i'm using flex 3 and flash 9, which i assume to the the problem. i cant locate the correct "Classes" directory for the class path. i also see various errors during class creation, which makes sense if it can't find stuff. any clues as to what i should set the classpath to? thanks. I'm using ASUnit-X to set up some unit testing on pre-existing classes and was wondering if there is a way to disable the attempt to overwrite the class .as file when you go to create the test. I don't want to risk overwriting the classes that are already written. I know it is simple to just hit "no" when prompted but I want to make the process as streamlined as possible when explaining it to some other people. Thanks! I tried AsUnit and it just works like a charm. Do you know of any nice big example projects using ASUnit that can be downloaded, that show how ASUnit is used in anger? All of the examples I can find are very contrived and simple. This is wonderful, I have a small note, When creating a Test Runner FLA, the classpath for ActionScript 2.0 Settings should be like this instead: /Applications/asunit-x.app/Contents/Frameworks/asunit/as25 with changing the last folder of course to match the current framework ..